Did Scott Pruitt Remake the EPA? Nineteen months after it received a nonprofit’s Freedom of Information Act request, the Environmental Protection Agency has responded with a small batch of documents that seem to undercut former Administrator Scott Pruitt’s hint of internal agency studies concluding that scientists are undecided about the human impact on climate change. Documents posted on Thursday by the nonprofit by Public Employees for Environmental Responsibility show that the agency conducted a “multi-month search for any evidence contradicting the proposition that human activity is the primary driver of climate change and now admits that it has found virtually nothing of substance,” as summarized by the nonprofit’s attorney. When the request produced no documents, the nonprofit filed suit, culminating in this week’s batch. The letter continued: “Of the 1,037 Outlook records that EPA reviewed 11 were responsive to PEER's request, as clarified. All 11 records were different versions of the same document. The document included EPA's responses to multiple Questions for the Record that EPA received from members of the United States Senate Committee on Environment and Public Works following Administrator Pruitt's testimony in front of the Committee on January 30, 2018. Today, EPA is releasing the final version of that document that was sent to Congress." The result, PEER noted, is a single noteworthy official document, which was not scientific research but correspondence with a Senate panel. Of the 108 questions the Senate Committee posed to EPA, only three related to climate change, the group said. 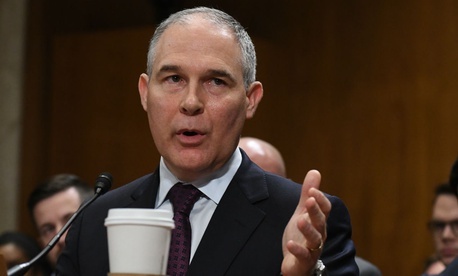 In his responses, Mr. Pruitt spoke of his desire to stage a "Red Team/Blue Team exercise" using different scientists to research climate science. "EPA knew from day one there was no needle in its research haystack," stated PEER General Counsel Paula Dinerstein. She said the only scientific information EPA could find was 2009 public comments submitted by a since-retired EPA employee. In the end, she added, "The agency engaged in a prolonged, expensive snipe hunt to delay this inevitable admission." EPA continues to post on its website a variety of scientific materials addressing climate change generally, though its changes to the presentation have drawn wide criticism.